Voyager has 12 needles, 1 head, LCD screen, 1000 spm, 12x12 inch field, USB and network ports, bobbin winder, 110 Vac. 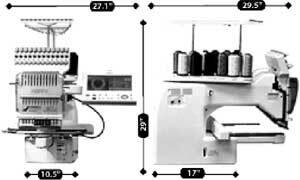 Happy Voyager HCH-1201 12-Needle Single Head Embroidery Machine. 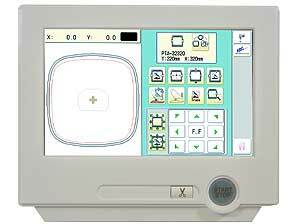 The Voyager is HAPPY’s best-selling single-head embroidery machine ever, and no wonder: Voyager’s unique combination of sewing power, quality, and user-friendliness is unmatched by any other compact multi-needle embroidery machine on the market. Happy Voyager HCH-1201 Key Features. 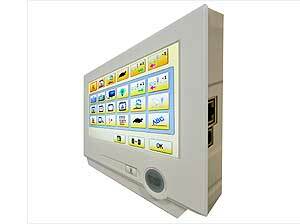 Intuitive color touch screen: on-board help, auto error correction. Large sewing field: 12 inch x 12 inch hoop. Compact: Small, stable 11 inch x 17 inch base, 88 lb total weight. Quiet, smooth operation: quietest of the entire product line. USB flash drive port: accepts various brands, sizes of USB flash memory sticks. Built-in networking: control multiple Happy machines from 1 PC. Accessorize: Compatible with commercial clamps, hoops and other add-ons. Easy design positioning with easy design trace, visual hoop maps. Large continuous sewing field eliminates design splitting or hoop turning. Built in fonts and stock designs. Happy Voyager HCH-1201 LCD Touch Screen. 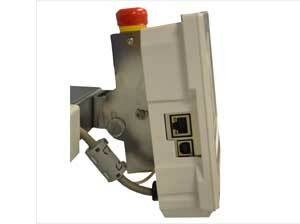 Single Head Machines have a 7 inch touch screen panel that is packed with features! The 7 inch touch screen has a vivid LCD interface. (With control panel) 27.1 inch. Machine weight: 88 lbs assembled; 125 lbs in box. Machine length/depth: 10.5 inches / 29.5 inches. Boxed dimensions: 36 inches L x 28 inches H x 20 inches W *. * Dimensions do not include shipping pallet. Normal (tubular) – 285mm x 290mm. Cap field 67mm x 290mm w.
Normal (tubular) – 1000 spm. Cap sewing speed 750 spm. Power Requirements: Standard 110v AC. Design memory: 40 million stitches or 250 designs. MaxColor changes per design: 99. Custom hoop memory: 15 hoops + HAPPY brand hoops.